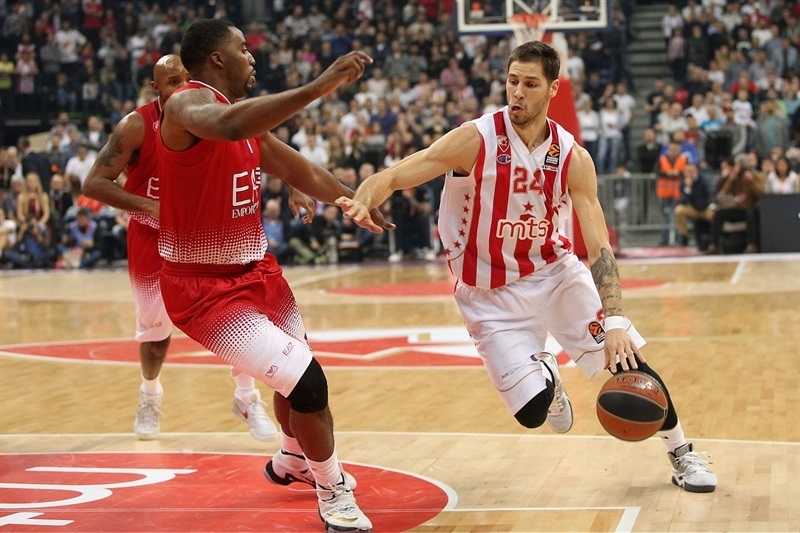 Crvena Zvezda mts Belgrade grabbed its second win this week by topping EA7 Emporio Armani Milan 83-70 in the Serbian capital in front of over 14,000 fans at Kombank Arena on Thursday. Both teams now have 4-4 records in the standings. 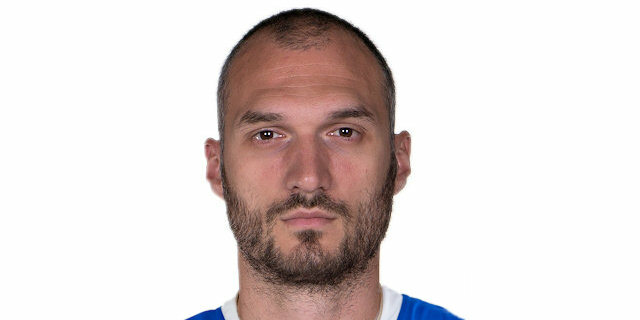 Marko Simonovic led the winners with 23 points and dynamited the game in the second quarter with 4 three-pointers in as many minutes. Nate Wolters added 14 points and 6 assists for Zvezda. Alessandro Gentile had 14 points for Milan. Zvezda limited Milan to 43.8% two-point shooting (21-of-48) and forced its opponents into 17 turnovers. Zvezda collected 9 steals and shot better than Milan from all distances, excelling from downtown (40.7%) and the free throw line (85.7%). 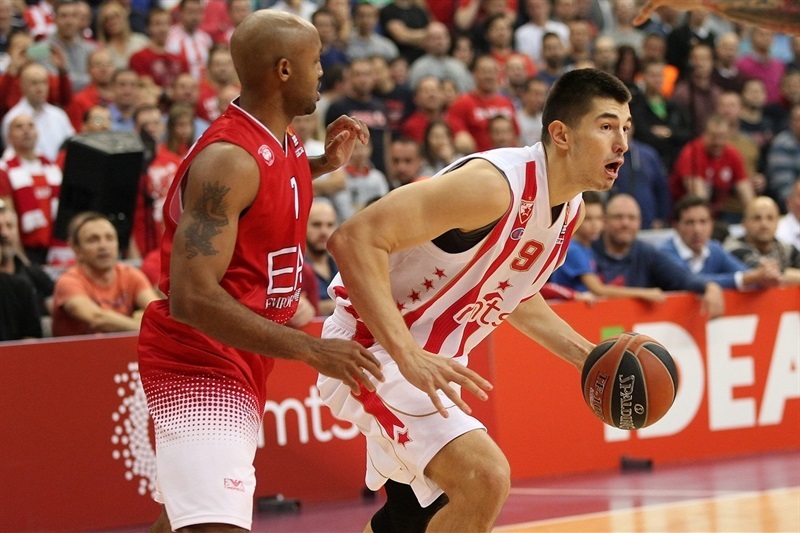 Zvezda had a strong start with dunks by Ognjen Kuzmic, Luka Mitrovic and Branko Lazic. By the time Kuzmic scored again, Milan was forced to call timeout at 10-4. Gentile and Ricky Hickman fueled a 0-6 run that Zoran Dragic capped with a layup for a 10-10 tie. A layup by Gentile soon gave Milan its first lead, 12-14. A layup by Hickman and a three-pointer by Mantas Kalnietis boosted the guests' margin to 14-19 after 10 minutes. 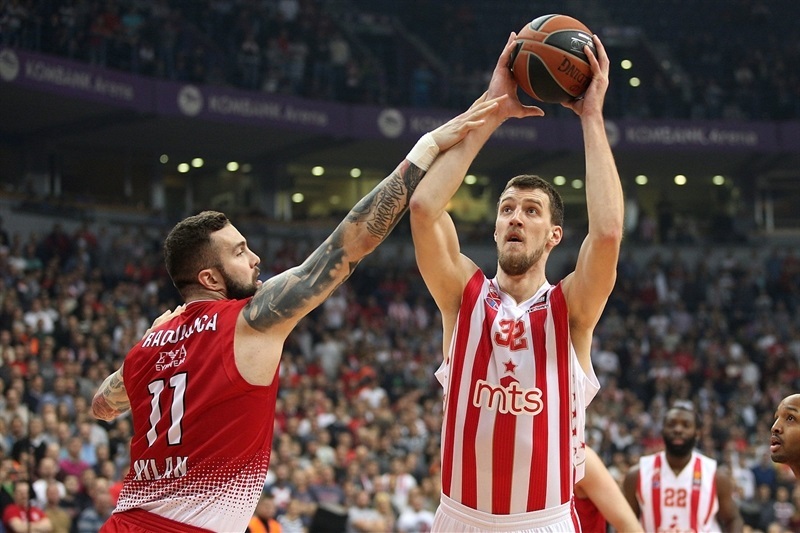 Miljo Bjelica dunked early in the second quarter and back-to-back triples by Simonovic put Zvezda in charge, 22-21. 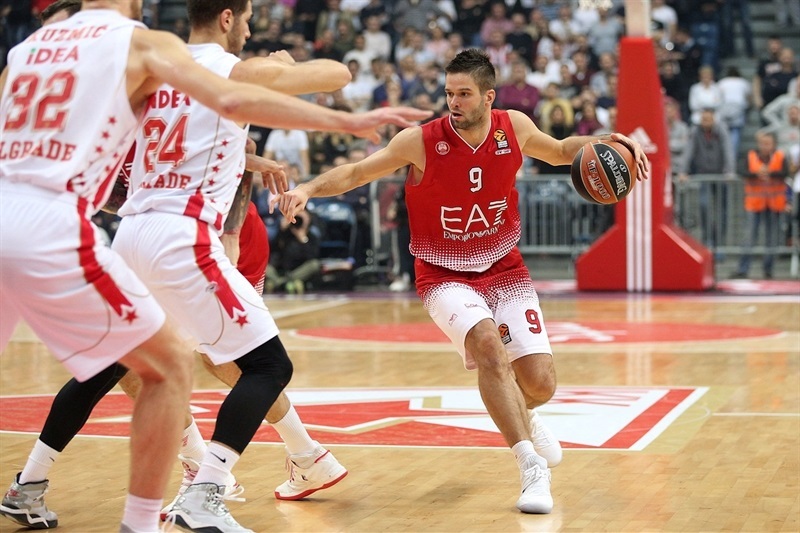 Kalnietis followed a driving basket with a layup, but a red-hot Simonovic hit another three-pointer, and yet another one to ignite the crowd at 30-25. Zvezda found a new go-to guy in Nemanja Dangubc, who followed a layup with a triple to keep the hosts ahead, 37-32, at halftime. Charles Jenkins and Sefan Jovic struck from downtown soon after the break to make it a double-digit game, 43-32. 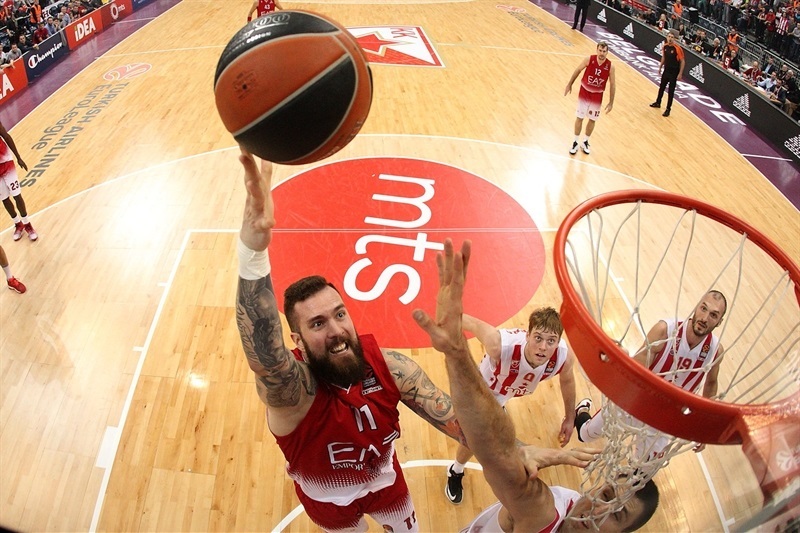 Raduljica and Dragic tried to change things for Milan, but Kuzmic and an outstanding Jovic kept Zvezda way ahead, 49-40. Dragic kept pushing Milan, but another triple by Simonovic gave Zvezda a 54-46 margin after 30 minutes. Jamel McLean stepped up for Milan early in the fourth quarter and free throws by Gentile gave the guests hope at 60-53. Wolters struck from downtown in a 10-0 run, which Simonovic capped with a fast break slam that sealed the outcome, 70-53, midway through the fourth quarter. 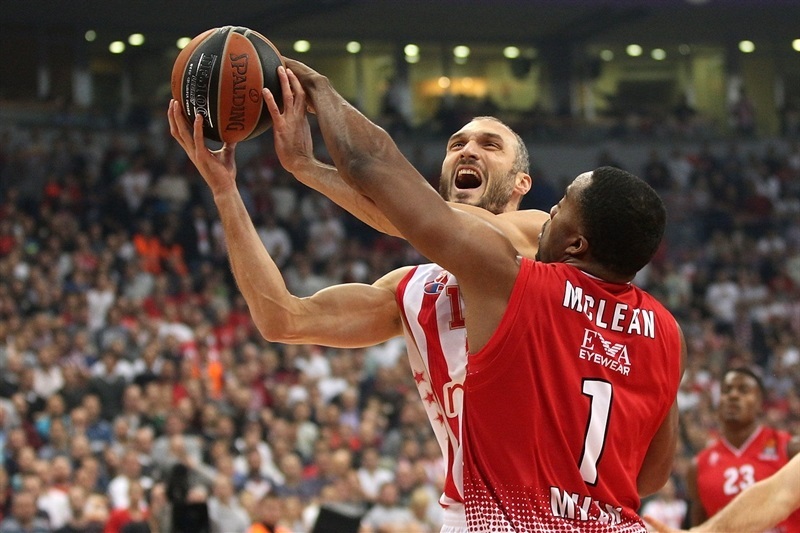 Nothing changed in the final four minutes, as Zvezda, backed by a great crowd, cruised to a well-deserved win. "Congrats to Zvezda for a deserving win. It is very difficult to say something smart. In preparation for this game, one of our two or three main goals was not to allow open shots for Simonovic, never to let him take easy shots with his face to the basket. It is hard to guard him once he makes his first shot, and that is what happened. It was a bad defense from our side, very bad. But we have to forget it, move on, and think about next game. 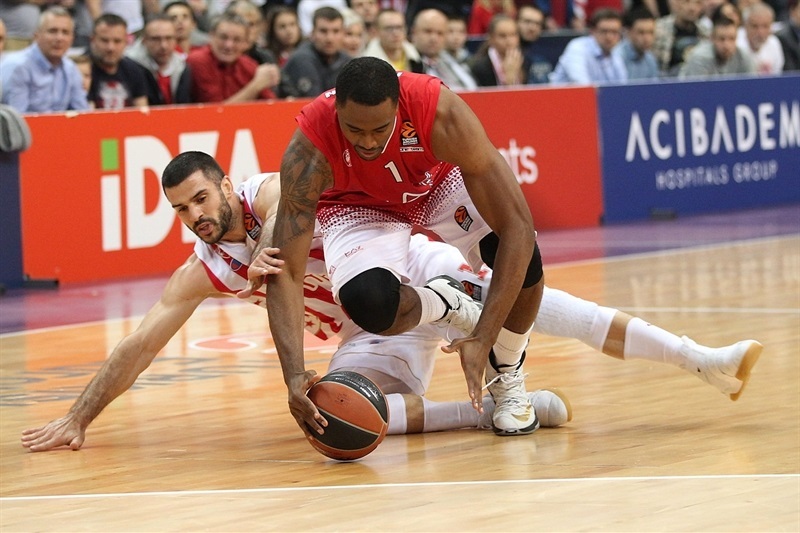 Zvezda is a team that plays the best defense in EuroLeague. They don’t let teams develop a quality rhythm, quality ball movement. But with all due respect, you cannot turn the ball over in one-on-one situation in your own half of the court. And that’s what happened to us. That has nothing to do with playing set defense." "It was a great game, a big win for us. We did a great job, especially on defense. We played very aggressive and didn't allow them to play well. They know how to play and understand the game. 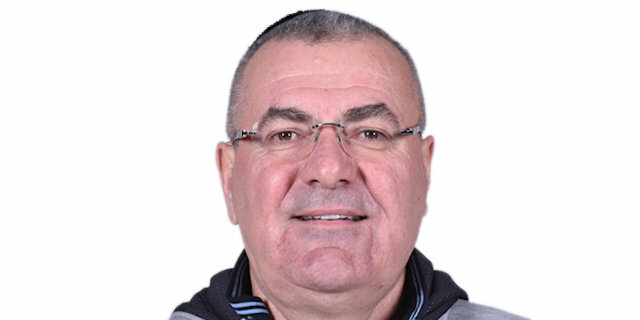 They have a great coach and are a great team, a big club that will probably get a big result this season. It is a big night for us, but we must forget this as soon as possible because we have to prepare the next game. This is my fourth season here and I always had a good relationship with our fans. Thanks to them; they gave us big energy tonight."